Vegan oreos on the half shell! 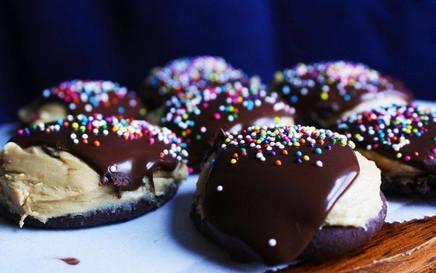 These peanut butter cookies on the half shell have a huge dollop of peanut butter oreo filling and no second cookie to get in your way. The crispy cookies are chocolaty and delicious and the creamy peanut butter filling is out of this world.